I discovered this game at a homeschool convention. I didn’t really need any curriculum that year (my youngest was a senior), but it seems my family can never get enough games. Then each person finds a word, phrase, or sentence(s) that they think fits the category. When time runs out, everyone reads what they have chosen and the judge decides who wins the round and awards them the category card. Then the next player becomes the judge and play continues until a certain number of cards are collected. Like Bring Your Own Book, the rules of Blokus are simple. Each person lays a tile down at a corner of another one of their tiles. Only the corners can touch. Easy, right? But there is more strategy to this game than meets the eye. Not only is each person trying to play as many tiles as possible, they are also trying to block the other players from being able to lay theirs down. Most of the time I lose at this one 🙁 But as the board fills up it reminds me of one of my childhood favorite video games, Tetris. So maybe I’ll keep trying. This is actually my favorite board game. Maybe because I actually win this one sometimes. (No, we aren’t competitive in this house at all 😉). I’ve found a great video from Watch it Played explaining the rules in case you are like me, and would rather have someone explain it to you than read all those eloquently written rules. Cooperative board games are fairly new to me. In these types of games, everyone is working together to beat the game instead of one another. They help kids, teens, and even some adults learn how to work with others. And for the teen (or adult) who struggles with losing, it’s nice to have a game where you are all the winners or losers together. 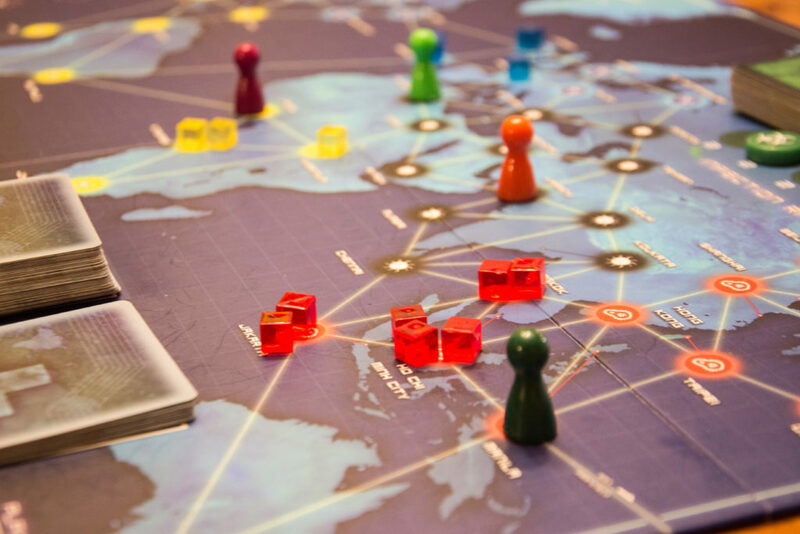 In Pandemic, players work together to save the world from…you guessed it, a pandemic. The diseases spread quickly, but by strategizing how to use each players unique roles and abilities, you can wipe out the diseases before they wipe out the world. Hopefully. We’ve actually lost more than once. This one has more detailed rules. And when that happens I don’t really want to read them. So once again if you are like me, you can learn how to play Pandemic at How It’s Played. If you like the idea of a cooperative game, but want one that doesn’t take quite as much time, check out Forbidden Island. (Or if you like dry heat more than humidity, there’s Forbidden Desert.) The rules are also a bit more simple, so if you have younger teens, or just don’t want to think as much when playing games, you’ll like this one. In Forbidden Island your family will work together to collect four treasures and then get off the island before it sinks. And for those of you like me who don’t like reading rules you’ll find a great explanation by The Games Room. I’m guessing you all have noticed a theme at this point. I LOVE reading usually, but I cannot stand to read game rules. It is surprisingly fun. But the 77 Ways to Play Tenzi is what makes it really fun. And slightly ridiculous at times. One night we all were barking at the end of each role. Our poor dogs didn’t know what was going on. You can buy a Tenzi “official” set, but we opted for getting the 10 sets of 10 die and the cards. It’s a great game with a group. There were many more I could have mentioned (like Catan! ), but these are the ones we have been reaching for the most. 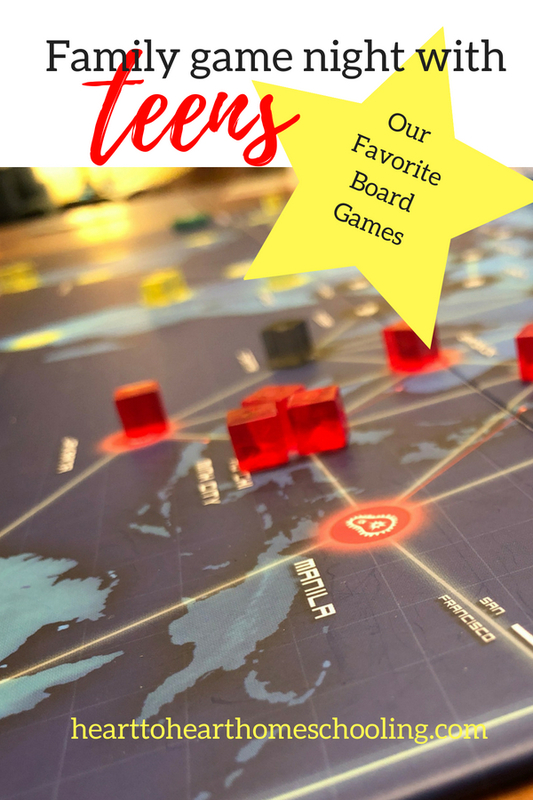 But whether you try one of our favorite board games or choose from your personal stash, I want to encourage you to plan a game night for your family soon. Laughing together and having fun is a great way to build your family relationships. Especially in the teen years. I”m familiar with a couple of these the others are new and sound intriguing. always fun to play a good board game. Bring your own book sounds like great fun!! We love Apples to Apples here. And being a D&D family, Tenzi is something we could probably play without even needing to buy the game. Thanks for both these recommendations! The current favorite game in our house is Splendor. LOVE pandemic! It’s hard to figure out at first but once you do it’s so much fun!